The first day sugar-free went pretty well. No headaches or crankiness… yet. All morning long I sipped on a kombucha while cleaning out the pantry, fridge, and sink. When my tummy started talking I made a quick scramble. 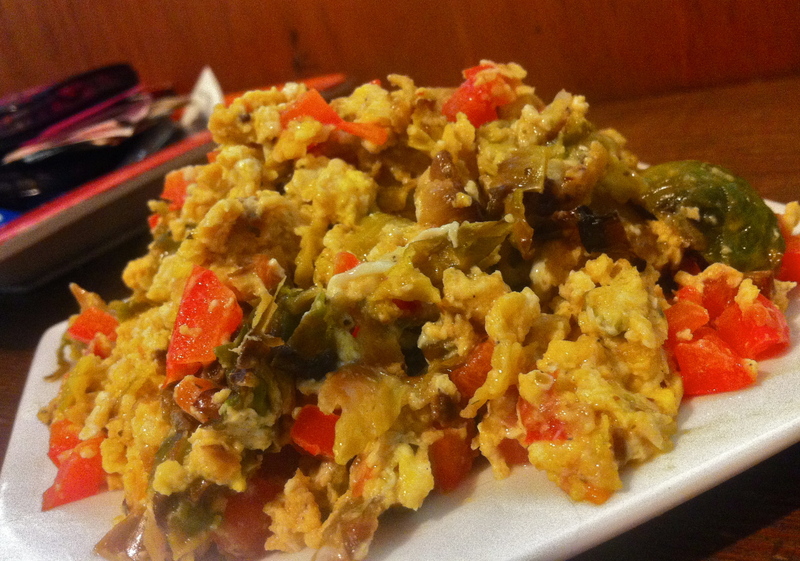 I sautéed some red bell peppers and leftover burssels sprouts in coconut oil, then added in two eggs and some salsa. I’ve been craving salty nuts lately (don’t go there) but they are soooo pricey. That or I’m just cheap. I picked up a bag of raw “fancy” nuts from TJ’s and brought them home to roast. Ahhmazing!! 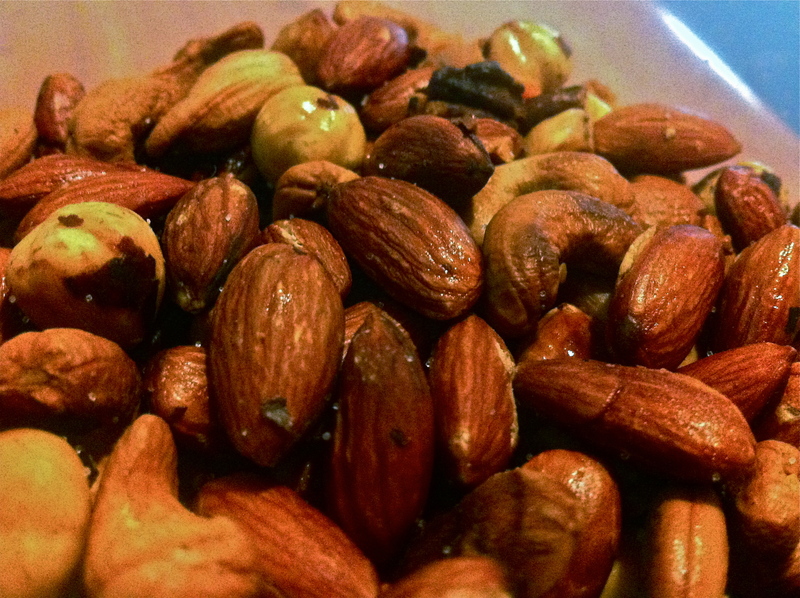 I tossed the nut mix (cashews, brazil nuts, almond, hazelnuts, and pecans) in some coconut oil, sprinkled them with salt, and popped them into a 400 degree oven for 10 minutes. After 10 minutes I pulled them out and mixed them all up then threw them back in for another 10 minutes. 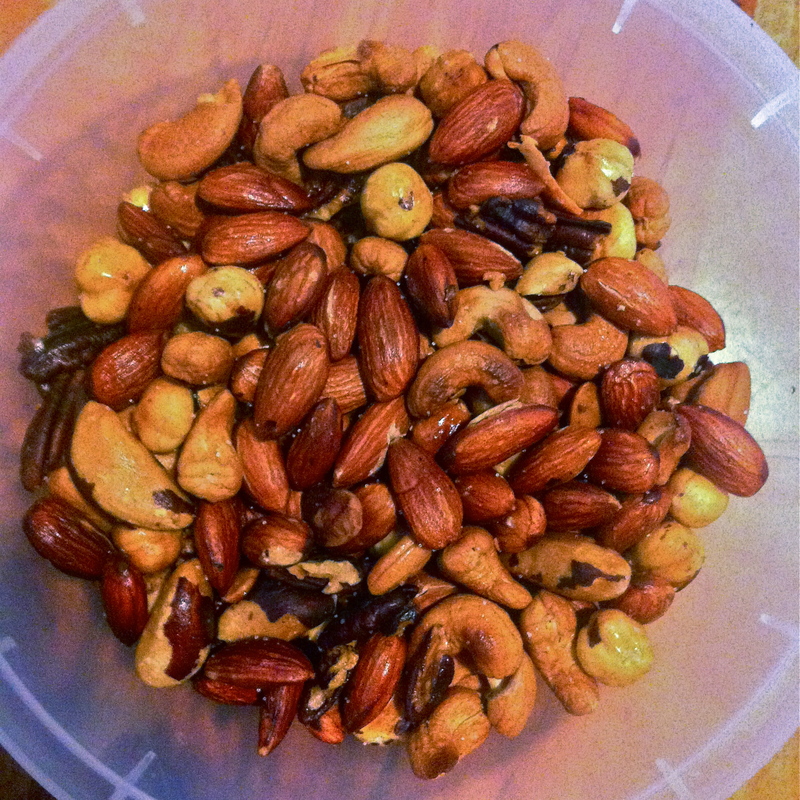 They’re a bit browner than other mixed nuts so next time I’ll probably just do 15 minutes total. They get crunchy after sitting out to cool. Salty and delicious, just how I like my nuts. That was pretty much my lunch, as I snacked on them throughout the day. 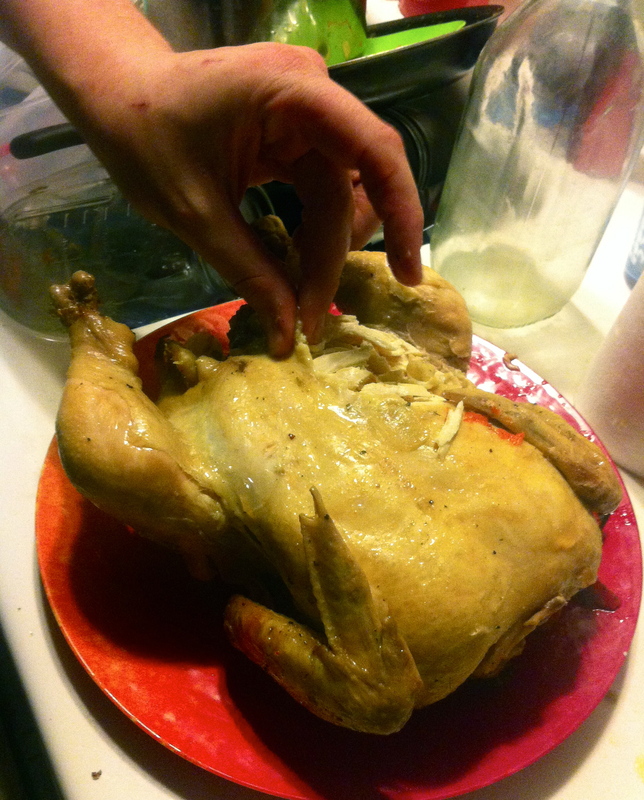 I finally got tired of them and started prepping dinner: roast chicken! I chopped a huge onion and a red bell pepper, along with some garlic cloves. Threw some onions and the garlic inside the chicken, and the rest into the pan. After rinsing and drying the chicken, I sprinkled it with salt, pepper, and herbs de provence before plopping it into the pan. 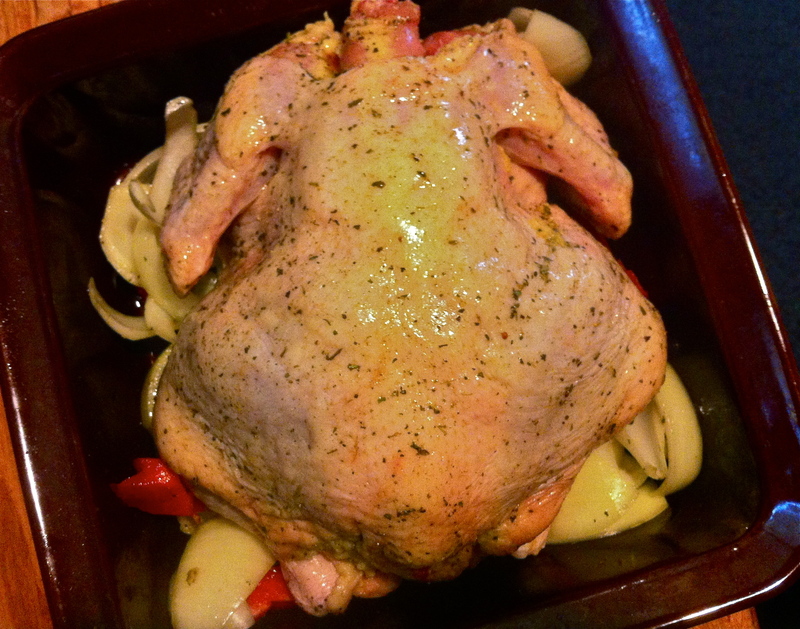 A quick drizzle of olive oil and the chicken was ready for roasting at 400. 90 minutes later the juiciest yummiest chicken was ready. 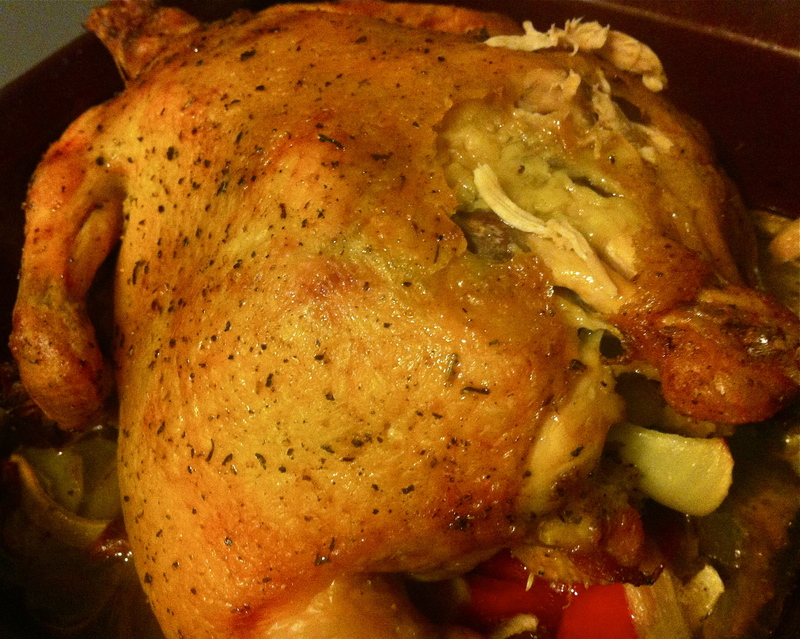 The skin got nice and crispy, and the veggies cooked down perfectly. Cj LOVES the crispy skin, he can’t ever keep away from it once it comes out of the oven. 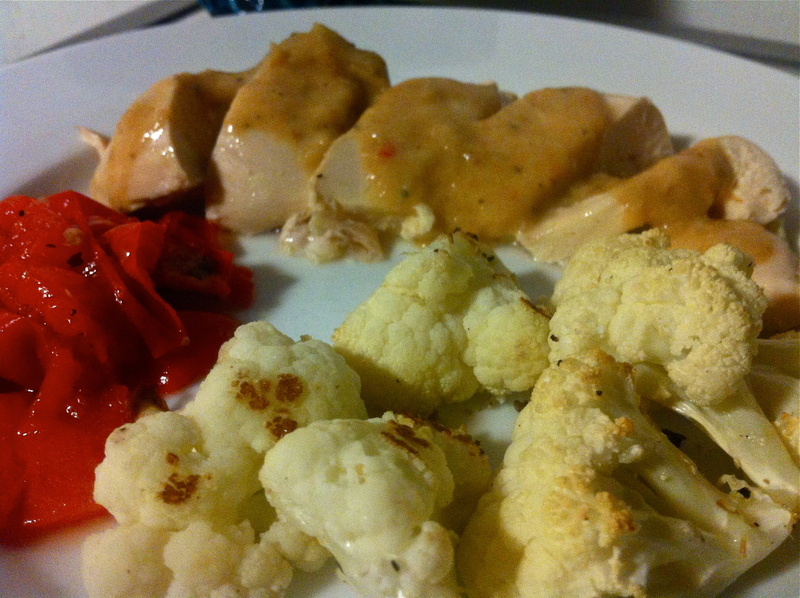 For gravy I blitzed the onions and chicken juices from the pan, and for a side I roasted up some cauliflower. Best gravy ever! Next time you roast up a chicken with some onions please please try it! All it takes is a quick blitz and a sprinkling of salt and pepper. Since I just love showing off what I eat, here’s some eats pre-challange. Friday night Cj took me out on a dinner date. That’s what he called it, I called it “feed me so I don’t get sick when I hit the bars with my girls later”. Same thing. We went to Hop Valley Brewery, a local brewery and restaurant. Their food is way too good. Despite their menu filled with tempting treats completely NOT paleo (fish tacos, crazy good sandwiches, pizzas, jalapeño cream cheese hush puppies) I did my best and got a salad. It was so tasty, I’m glad I went with this. 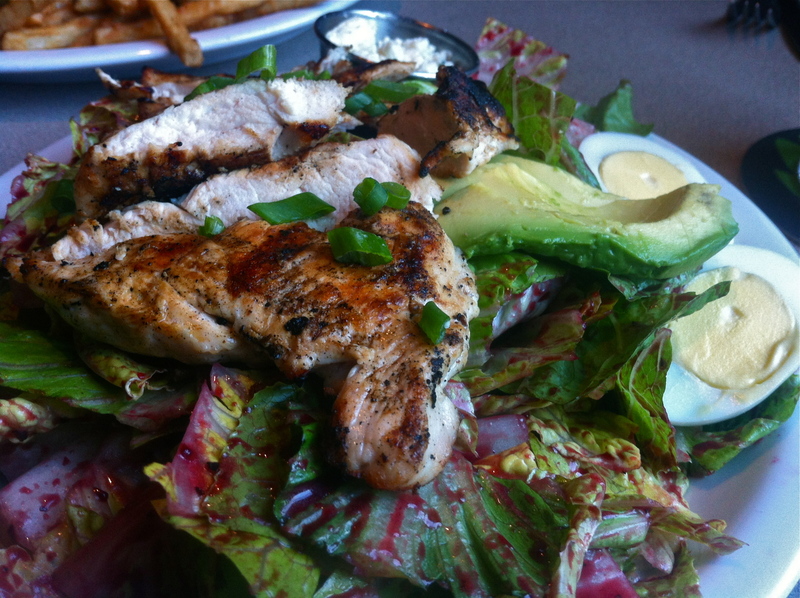 Instead of the blue cheese dressing I had it with their marionberry vinaigrette. I loved every bite (and believe me, I ate every bite), as did Cj. He hates salads so it says a lot. 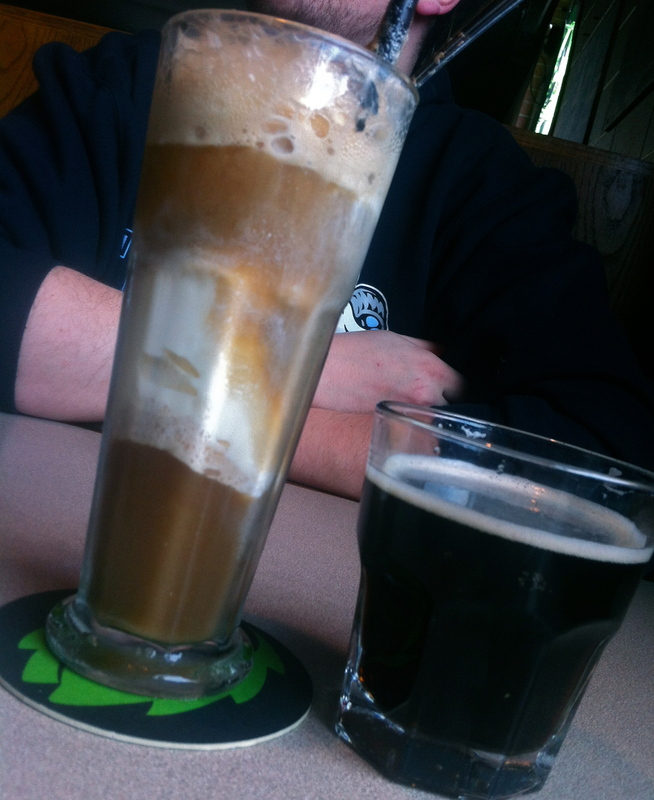 He went with a burger (shocker) sans the bun and a house brewed root beer float. 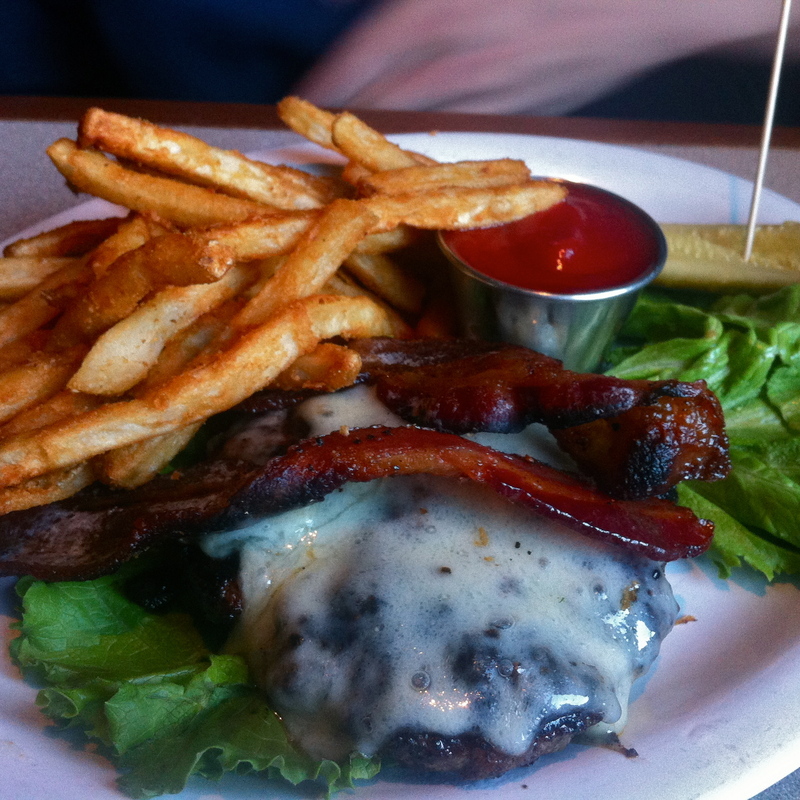 I may have poisoned tested a few fries…. .. and his float. They were safe. I just love big salads so much they’re hard to beat. 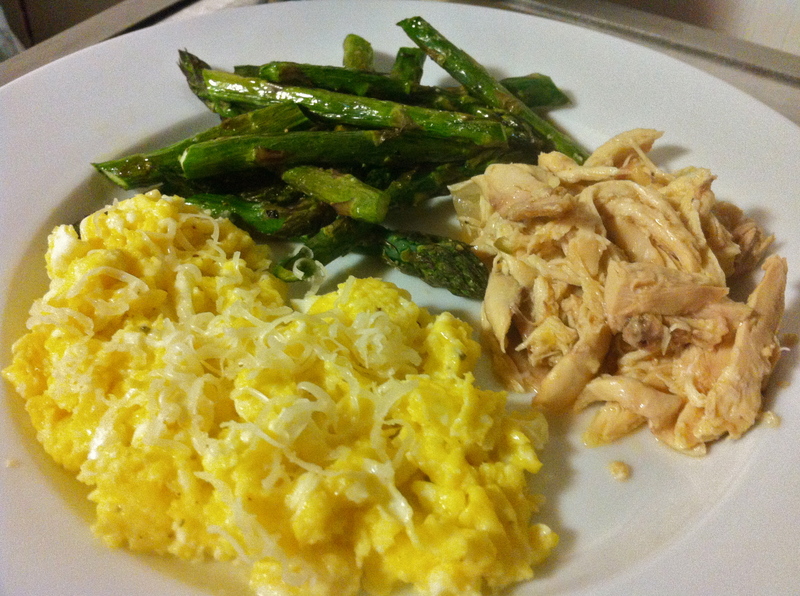 We had scrambled eggs, leftover lemon chicken, and roasted asparagus for dinner the next night. 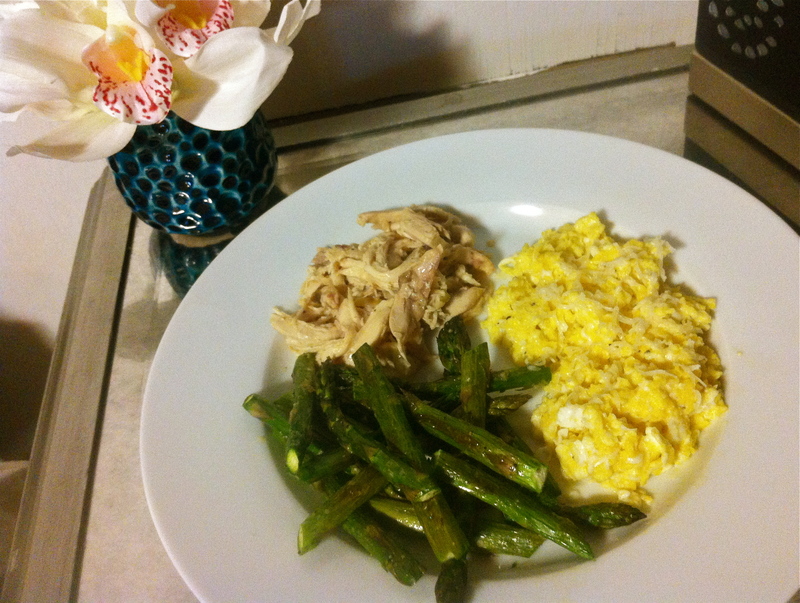 I first saw asparagus and eggs together on Barefoot Contessa years back, and now I love it! Easter brunch was delicious too. 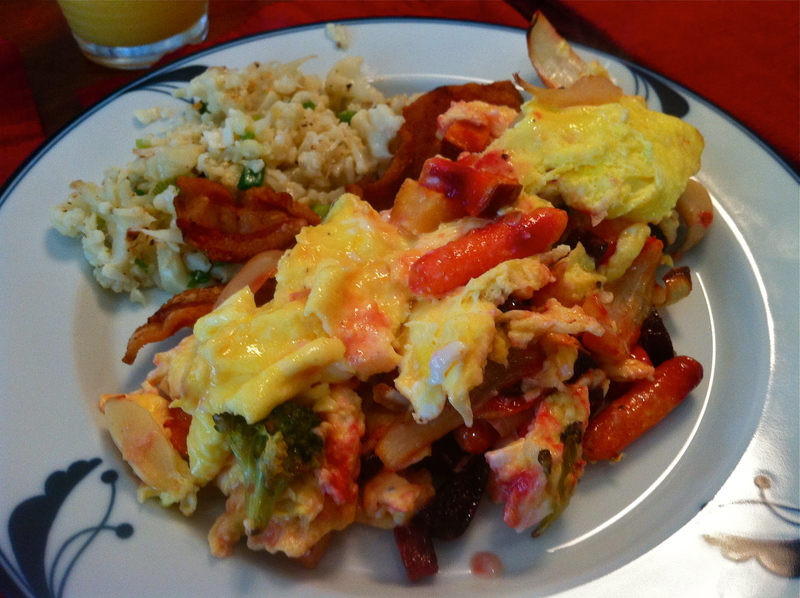 We drove up to Portland for my mom’s paleo approved meal of roast veggies, eggs, bacon, and her version of cauli mash. It was delicious and I was stuffed. Hope everyone had a good holiday! What did you grub for Easter? Wonderful! So you live near Portland Oregon? We are not far away down at the coast. So what is “blitz” the gravy? Never heard that cooking term before but looks faboulous! Blitz is to just blend it up, either in a blender, food processor, or whatever with a blade! 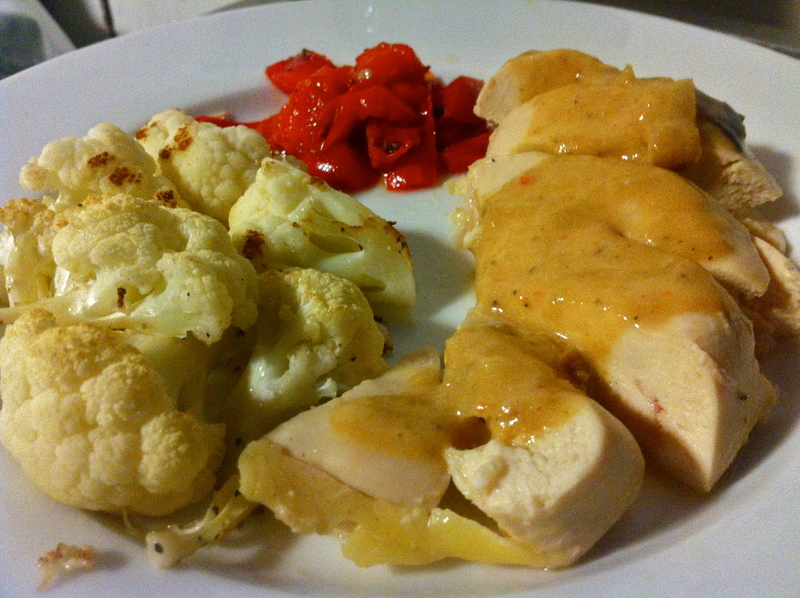 It made a puree out of the onions and chicken juices… way too delicious!! Just looked, Eugene area! Paleo Oregon cavesisters!